The religious events commemorated by Christians around the world during this and every Easter weekend took place in Jerusalem almost two thousand years ago. Around three hundred years after the crucifixion of Christ, Helena, the mother of the Roman Emperor, Constantine, and a devout Christian, travelled to Jerusalem, where she claimed to have discovered the tomb of Christ, together with wood and nails from the True Cross, and even the socket in which the cross had stood. Her son provided the funds for the construction of a basilica on the site, which became one of the first pilgrimage destinations in the Christian world. The Church of the Holy Sepulchre that can be visited today is an Eleventh Century construction funded by a later Byzantine Emperor, Constantine IX Monomachus, replacing the earlier buildings that had been damaged by at least two earthquakes, as well as by Sassanid Persian and, later, Muslim invaders, but its walls closely follow the footprint of the original basilica, and it remained a pilgrimage destination throughout the Middle Ages and into the modern era. 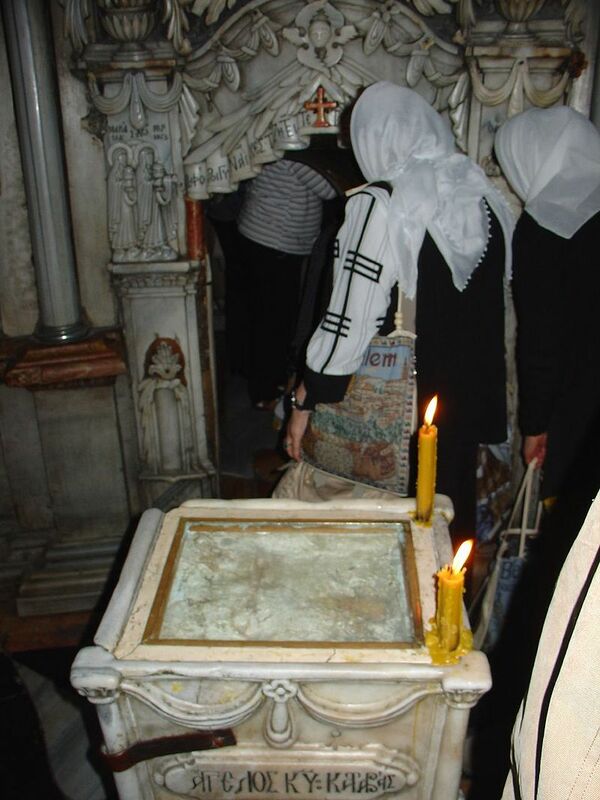 The Church of the Holy Sepulchre, Jerusalem (Photo: Berthold Werner, licensed under GNU). One pilgrim who visited in the Fifteenth Century was the Milanese clergyman, Canon Pietro Casola, who has left us a detailed account of his visit. One might have thought that Easter would be the perfect time to make this pilgrimage, but this posed practical problems: sailing was a seasonal activity, with few ship-owners willing to risk their vessels on the high seas between October and April. Casola joined his ship at Venice on 4th June, arriving in Jerusalem at the beginning of August. Here are some extracts from his account. "We waited until sunset expecting the Moor who keeps the keys and who could not be found. You must know that although the Sepulchre is governed by the friars of Mount Sion and by other sects of Christians, as you will hear, nevertheless they cannot go in or out at pleasure, but must do so at the pleasure of that dog who always keeps the keys ... finally ... by the grace of God, we entered that Holy Church." The Church of the Holy Sepulchre. Image: MHz'as (Public Domain). "Because it was already night every pilgrim immediately lighted his candle, and the friars of Mount Sion who had come for that purpose began to form the procession, beginning at a Chapel of Our Lady, where the offices are said continually by the friars ... In that place Christ appeared to his blessed mother after the Resurrection." 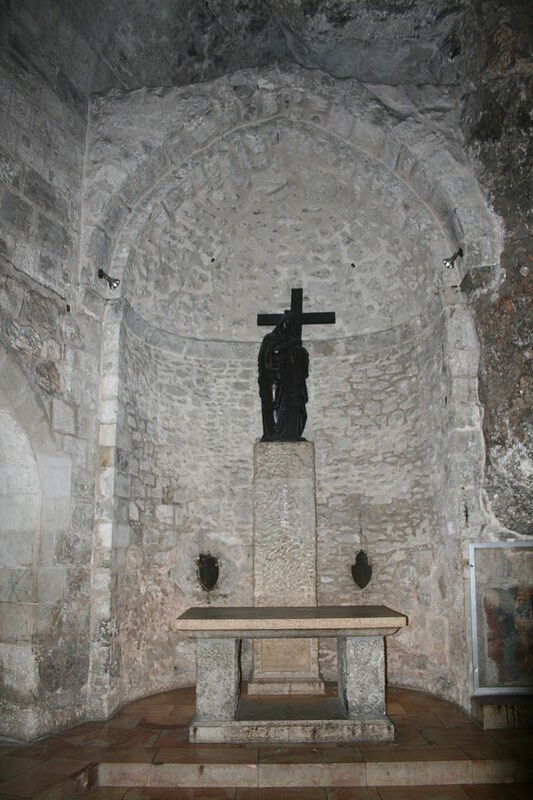 The Chapel of the Apparition, marking the place where the risen Christ is believed to have appeared to his mother (Photo: Seetheholyland.net, licensed under CCA). 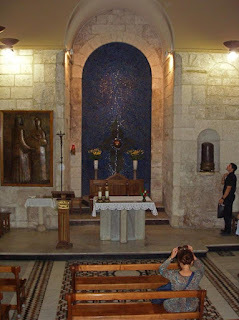 "We then visited the place where Christ remained in prison whilst the hole was being made in which the cross was erected. Then we visited the place where the garments of Christ were divided, and where the lots were cast for them." The prison in which Christ is believed to have been held prior to his crucifixion (Photo: Ian & Wendy Sewell, licensed under GNU). "Then we went into the Chapel of Saint Helena, which goes down several steps, and after descending several other steps we saw the place where the Cross of Christ was found, which is below the place of the Calvary." The Chapel of Saint Helena, or "Grotto of the Cross" (Photo: Diego Delso, Wikimedia Commons License CC-BY-SA 3.0). "Then we mounted to the place of the Calvary, by a wooden staircase, with the greatest reverence. There a beautiful sermon was preached on the passion of Christ by one of the friars of Mount Sion, in such a way that I believe that if those Moorish dogs had been present, together with all the pilgrims, they would have wept." 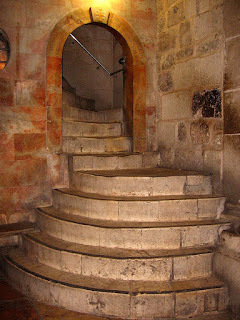 The steps leading to the Rock of Calvary - the stone steps have presumably replaced the wooden ones described by Casola. Photo: adriatikus (licensed under GNU). 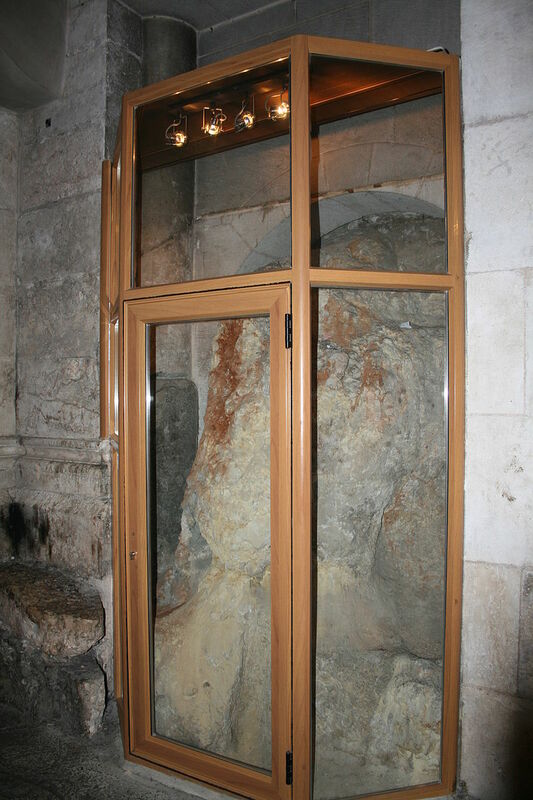 The Rock of Calvary, where the cross is believed to have stood. Photo: Diego Delso (Wikimedia Commons License CC-BY-SA 3.0). "We stayed there for over an hour, and when the sermon was finished and the usual prayer had been chanted we descended to the Holy Sepulchre and entered one by one." 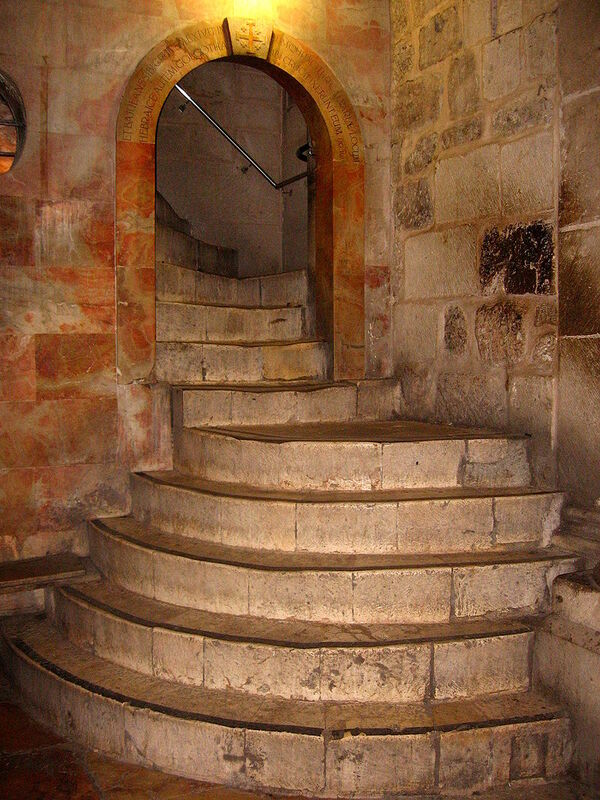 The "Edicule" covering the Holy Sepulchre. Photo: Berthold Werner (image is in the Public Domain). 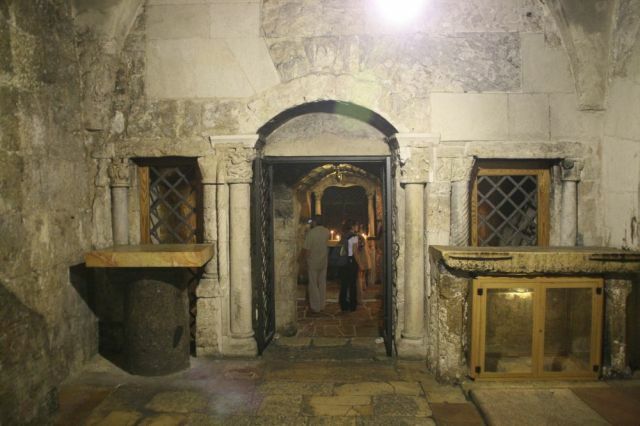 The entrance to the Tomb of Christ. Photo: amanderson2 (licensed under CCA). 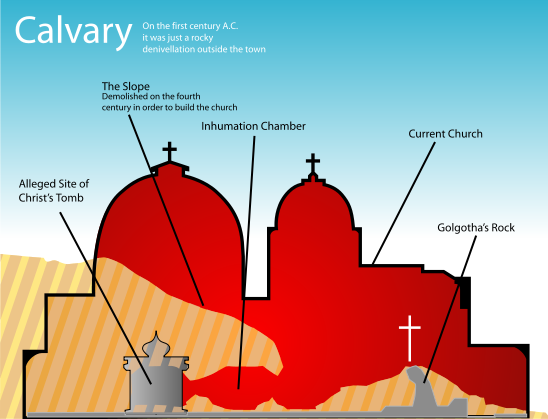 "Then, after the scrutiny had been made, and the number of pilgrims taken by the friars - I mean of those who wanted to say Mass - they made out the clear lists, and we were divided between three places - that is, the Sepulchre, the place of the Calvary and the Chapel of Our Lady. 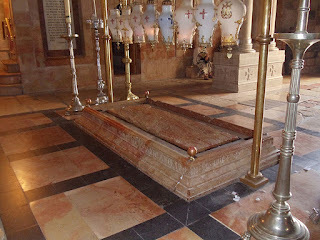 Mass could also be said in the place where the body of Christ was laid when he was taken down from the Cross, whilst he was being anointed with the mixture brought by Nicodemus, and by Joseph of Rama, before he was laid in the Sepulchre. In that place, anyone who wished could say Mass without any other order. According to that first arrangement I said Mass above the Sepulchre." The Stone of Anointment. Photo: Mario Hen (licensed under CCA). "On Friday, the 8th of August, at the third hour of the day, we were let out of the church of the Sepulchre, and each of the pilgrims went to his lodging to rest as well as he could." Cross-section of the Church of the Holy Sepulchre. Image: Yupi666 (licensed under GNU). Casola's is one of several historical accounts which formed the basis for my research for "Jerusalem," one of the stories that make up my novel, Omphalos, and which follows the pilgrimage of a Sixteenth Century cleric, Richard Mabon, to Jerusalem. Mabon is a historical figure, a Dean of Jersey, who did make the pilgrimage, but, unlike Casola, he has left us no written testimony. Thanks for this, Mark! Whose translation was the above? I briefly visited the Church of the Holy Sepulchre on my first visit to Israel, but we didn't hang around long enough to see all those parts of it above. Thanks, Sue! The translation is by Mary Margaret Newett in 1907. It's available, I think, as a print on demand facsimile through Amazon. I don't know if there is also a more recent translation (to avoid copyright infringements, I tend to use older translations in any case).